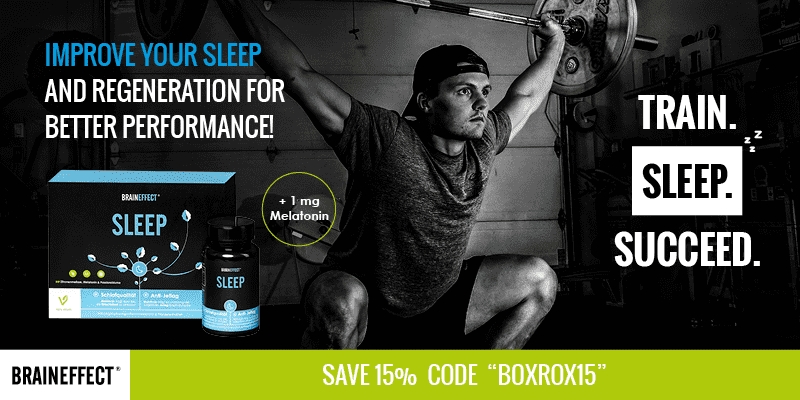 To improve your recovery you get 15% off SLEEP from BRAINEFFECT until 27.12. SLEEP helps you regenerate better after a hard WOD! It combines proven natural ingredients such as magnesium, passionflower, and lemon balm, which have calming and relaxing effects, with the natural sleep hormone melatonin, which is responsible for the natural human circadian rhythm and therefore the degree of your recovery. Your readiness as well as your performance in the next workout will improve when you sleep better. When your cortisol level is high and you can’t fall asleep at night due to a late workout SLEEP will help your body to relax and fall asleep faster because of its unique and optimized formula. You can use SLEEP situationally or on a daily basis. The effect can be observed after the usage of two capsules. Long term use is possible and save. Professional athletes already take SLEEP to improve their recovery. SLEEP is tested and certified by the Kölner Liste! So what are you waiting for?! Save 15% with the code BOXROX15!